How did you first meet Mick and Jackie? I was working in Italy for another travel company when I first met Jackie and Mick, and I remember Mick wowed us all when he gave us a demonstration on how to peel an apple!! How do you come to live where you do in the French Alps? After a few years of summers in Italy and winters in Val d'Isère, my Swedish husband and I needed a base. Our first nest was a tiny 20 square metre studio in Val d'Isère; certainly a good test for a marriage! We now live in a lovely 300 year old house in a tiny hamlet nearby, with our two children. What do you love most about Italian food and wine? I think I'd have to say the quality of the basic products and the simplicity of the cooking. And Aperol Spritz of course!!! What are your impressions of Hedonistic Hiking tours? They are simply "hedonistic". I feel lucky to be part of the team. 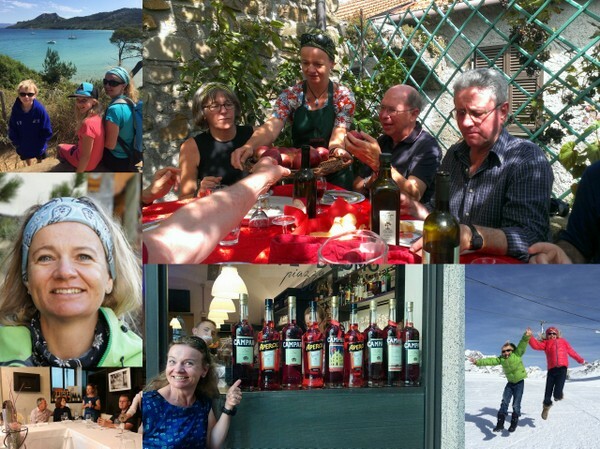 Fantastic walks, wonderful food and wine, friendly hotels and a very enthusiastic and knowledgeable leader!!! Hmmm! Tricky one. I ski all winter, walk all summer in the Alps, travel around Italy in Spring and autumn. Maybe an active family holiday at the sea with lots of yummy fresh fish. We really want to try and maintain our wonderful lifestyle for as long as possible.